Is NYLT complete after camp? Yes; The NYLT course is completed and each individual graduates and is recognized as having completed the entire NYLT course of study with an NYLT patch, Certificate of Completion, and an NYLT Trained strip for addition to their official uniform insignia. No; Like the Eagle Scout rank and Wood Badge adult training, NYLT should be viewed as the beginning of the youth’s true leadership experience. The course is enhanced by the youth proposing and accepting a Personal Challenge that they create and have approved by their Troop Guide and NYLT Scoutmaster during course week. The youth is challenging him/herself to bring skills they have learned and ideas for improvement that they can apply in their local unit, in order for them to gain further application knowledge and for their unit to benefit from their training. The Personal Challenge does NOT change the requirements of the course. It is strictly a NFC created tradition added to enhance the NYLT accredited course. Completion of the Personal Challenge within 12 calendar months will result in a formal celebratory presentation of the NYLT neckerchief designed for that participant year. Is NYLT a week at summer camp? No. NYLT is a leadership training course in an outdoor environment. There are no rank advancement or Merit Badge opportunities during the week. The purpose of this course is to develop leadership skills that Scouts will use in their home troop and throughout their lives. Boy Scout/NYLT participants must be thirteen years of age by the First Day of the Course, be in a position of leadership (Senior Patrol Leaders, Assistant Senior Patrol Leaders, Patrol Leaders or Scouts who will be candidates in the near future) and be First Class rank. Venture Scout/NYLT participants should be interested in attending the course and learning leadership skills to help them lead their Crews. Females must be Venture Scouts, age 14 and up. The youth must want to attend NYLT and have the enthusiasm and desire to participate in this learning experience; participants only get as much out of it as they put in. Because NYLT requires camping skills, all Scouts must have had at least one long-term camping experience. Who should not attend NYLT? NYLT will not “fix” your problem Scouts and cannot change Scouts who do not want to learn or participate in the program. NYLT will nourish the leadership ability of the Scouts that you count on to run your troop. NYLT will not help Scouts with discipline problems or homesick problems. Scouts with discipline issues will only disrupt efforts to train other Scouts as leaders and will likely be sent home without a refund. Removal of a Scout from the program is not done lightly and is reviewed thru a multi-level process and ultimately thru the course Scoutmaster. If a Scout is removed from the program, his parents will be called and need to pick him up at camp. All of our staff members are very busy training leaders during course week and do not have time to tend to Scouts who are not mature enough to attend a week long leadership camp. If you have any questions about the appropriateness of any Scouts attending NYLT, please contact the Scoutmaster at sm@nfcnylt.org. Once the course limit is reached, all other Scouts will go on a waiting list. Register soon to avoid problems as the course will most likely fill up. A copy of the completed & signed application including Code of Conduct; BSA medical forms A, B, C; and course fee payment. PLEASE STATE ALL FOOD AND MEDICAL ALLERGIES AND HEALTH CONCERNS. The medical form must be completed by a physician or nurse. A copy of the form kept by your home troop is acceptable. The Course fee is $225.00 if paid on or before early registration deadlines, or $250 thereafter. Is there a handling charge for registration or application fee? Is the home Scoutmaster involved? Absolutely! 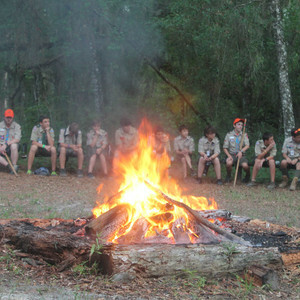 NYLT is designed to enhance the Scouts relationship with his home Scoutmaster. 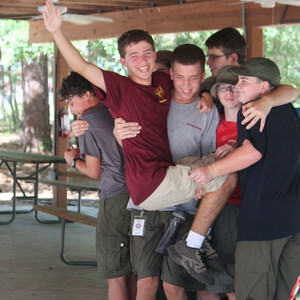 The home Scoutmaster coordinates and encourages the Scouts completion of his NYLT Personal Vision Challenge; a set of goals and plans the Scouts develops during the training week. 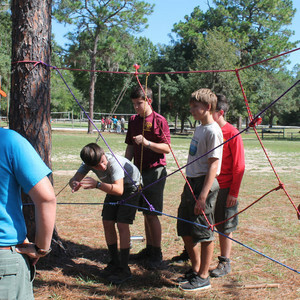 The home Scoutmaster and Scouts may also change the challenges as needed to meet the troop's needs, and with approval of the NYLT Scoutmaster. Upon a Scouts completion of his Personal Vision Challenge, the youth or Scoutmaster e-mails info@nfcnylt.org, stating that the Scout has completed the goals as agreed upon with the NYTL staff. Supplies allowing, the youth will be presented with a limited edition NYLT Personal Challenge neckerchief at the troop’s next Court of Honor. How will Scouts live during NYLT? Scouts will be placed into a patrol consisting of approximately eight Scouts from around the Council. Each patrol has its own site with its own stoves and patrol cooking equipment. Fresh food supplies are distributed daily. Scouts will prepare their own meals as Patrols. 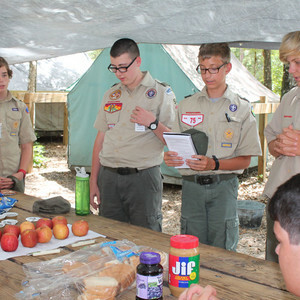 Scouts spend five nights in the Camp’s platform tents, with 2 Scouts sharing a tent, and one on the trail in their own two-man backpacking tent. We have no trading post on camp. No candy or snacks are allowed at the course. All soda machines are turned off. We highly encourage drinking water all throughout the week. What about meals and special dietary needs? Scouts will eat 'Jamboree' style. The patrol will pick up food at the Commissary and will prepare meals in camp. The Scouts will be cooking on Coleman camp stoves. Scouts with special dietary needs should indicate them on their application. We can accommodate most dietary needs but do require advanced notice. Sometimes, youth are permitted to bring special food for prescribed dietary needs, and we will assist with storage and distribution of those items. Summer: An equipment list is located in the tab section of the website. Each Scout should have 2 full Scouts uniforms with shorts (no long pants). Sashes are not worn. Please remove pocket-dangle patches prior to the event so they are not lost. Tents are provided except for the overnight hike where the participants will need to bring their own backpacking style tent. Pocket knives are allowed, but no sheath knives are permitted. Winter: An equipment list is located in the tab section of this website. Each Scout should have 2 full Scout uniforms with shorts (no long pants). Sashes are not worn. Please remove pocket-dangle patches prior to the event so they are not lost. **There are no tents available at St Johns River Base at Echockotee. Each participant must bring their own tent and there will be an overnight backpack trip so backpacking style tents are a good idea. Do I need a backpack? Yes. You will be expected to carry all of your equipment to and from your campsite; a hiking backpack will be essential during the overnight hike. A day pack is useful for daily hikes to and from the campsite and learning areas. How can I contact a participant? Due to the tight schedule followed at NYLT, visitors are discouraged because of disruption to the program and the difficulty in providing make-up sessions. In case of an emergency, call the Camp Shands Ranger at (352) 475-1212 or the St Johns River Base Ranger at (904) 250-9981. He will promptly contact the NYLT staff and we will immediately notify the Scout. All communications by participants to outside parties MUST go through an adult staff member. Any communications by participants to outside parties without permission of an adult staff member will be considered a violation of the Code of Conduct and possible expulsion from the course. No jeans allowed. All uniform pants must be BSA approved or near enough that close inspection is required to tell the difference, or this may be considered a Code of Conduct Violation.